Retreat cost - from only £199 - includes accommodation, yoga classes, kirtan, workshops, delicious vegetarian meals, sauna... more information below. The Heart of Yoga Retreat offers an opportunity to explore and practice Hatha Yoga and Bhakti Yoga, the Yoga of love and devotion. In this weekend intensive we will focus on integrating unconditional love and devotion into the time honoured practice of Yoga. Our weekend retreat is an opportunity to nurture, step out of the head and into the heart, it is an opportunity to revitalise on all levels, connecting with your true Self and others. Flowing traditional hatha yoga sessions will naturally open the heart and nurture you to a space of surrender and stillness. Practices will be intuitive, strong, deep and supportive and cater for all levels from the novice to the seasoned practitioner. We teach traditional Hatha Yoga, Sivananda, Hatha Flow and Yin Yoga. A typical class will include asana (postures), pranayama (breathing exercises), hands-on adjustments, guided relaxation, chanting and a taste of philosophy. The schedule also includes kirtan, puja, devotional chanting of mantras and spiritual talks about Yoga philosophy.. There will be plenty of time for you to indulge in a massage or you may like to relax and steam detox in the sauna or simply curl up in the garden with a book, the choice is yours. Shekinah is only a short walk from the Tor, a famous pilgrimage site in Glastonbury. Please see below for an example of the retreat schedule. 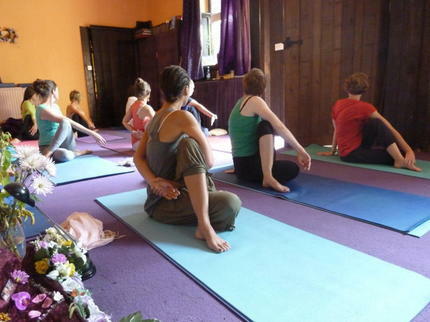 Yoga Classes - Traditional Hatha Yoga. The classes will vary accordingly, some classes will be more dynamic and flowing, others will be slow, meditative and with the use of mantras. We also teach Yin Yoga and Yoga Nidra. Classes are suitable for all levels. Kirtan/Mantra Chanting - Kirtan is a very beautiful practice that melts away any worries & concerns, opens the heart and simply makes you feel great! Kirtan is an essential part of Bhakti Yoga and is the singing of mantras or prayers, usually with musical accompaniment. Kirtan is an opportunity to open the heart and sing to the Divine. Joining in song and voice we can open to Pure consciousness and love. You don't need to be a singer to participate... just sing from your heart and feel the bliss! Vegetarian Meals/drinks - All meals are wholesome, nutritious, vegetarian, homemade and cooked with love! We follow a yogic diet and respectfully ask that you do not bring any meat, fish, eggs, onion, garlic or alcohol to the retreat. Herbal teas are available. Massage - A variety of massage treatments are available for you to enjoy. Massage is not included in the retreat and is at an additional cost. 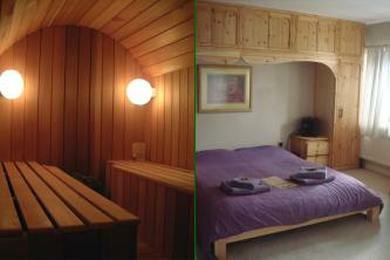 Sauna - A sauna is available for your use... while away your time in the sauna and truly unwind! Retreat - In order to get maximum benefit from the retreat we encourage full participation in the programme. However, this is also your retreat and if you feel you may just need some quiet time and not attend one of the classes, then of course no problem. Just a gentle note that the retreat space is not a hotel, we ask that each person helps to clean up after themselves in order to maintain the cleanliness and purity of the ashram during the weekend. Shekinah Yoga Retreat is, situated on the side of Chalice Hill, and has been a hub of activity in Glastonbury since its inception in 2003. It is a place of retreat and celebration both peaceful and dynamic, the ambience here is homely, relaxed, grounded and is focused on living consciously, peacefully and truthfully. This is a place to take rest, reflect and journey deeper into your spiritual practice. As a spiritual community, Shekinah is a western evolution of an ancient tradition where sacred space is created away from the world where individuals come to both cultivate and draw upon spiritual sustenance. The ashram is run by Elahn Keshava and Gisela Lirusso (Radhe), a great team of staff, Preet, Angie, Gita & Elaine and a devoted group of local volunteers. There is a friendly, devotional atmosphere where work is treated as meditation and selfless service is used as a spiritual practice. We offer clean and comfortable accommodation with a range of pricing options as below. Accommodation is allocated on a first come first served basis and is subject to availability. We suggest you book early to secure the accommodation of your choice. Prices are per person and include all classes, accommodation, meals, workshops and sauna. Lila has been teaching yoga on a full time basis since 2001. She is a registered Senior Yoga Teacher and Teacher Trainer with Yoga Alliance. As a result of years of practice and study, Lila shares the wisdom and joy of yoga from the heart. 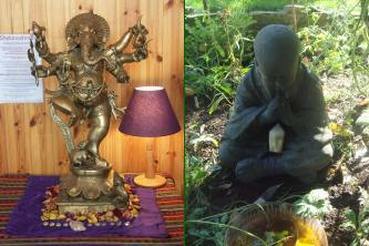 Shekinah Yoga Retreat is situated on Dod Lane in Glastonbury, just a few minutes from the Chalice Well. There are regular buses into Glastonbury from Bristol and Bath (approx. 1 hour away). We would advise travelling by train into these stations, and then taking a bus from there. If you are taking the train to Castle Cary, the bus service is sparse and a taxi to Glastonbury costs around £35.00. 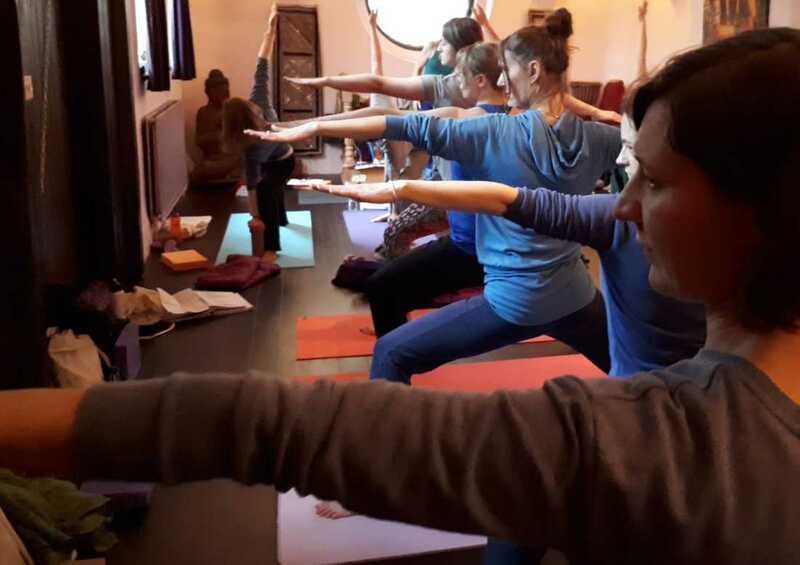 Arrival time on Friday 1st March is from 2pm onwards and the first yoga class will be at 4pm. On Sunday, 3rd March, the retreat will finish at 4pm. Please complete a Booking Form. Once we receive your form and payment we will confirm your place. Places are limited on the retreat - we suggest you book early.